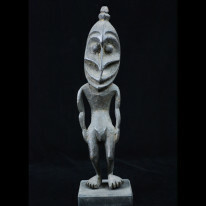 Papua New Guinea Clan Bat Figure. The large flying fox fruit bats, with wingspans up to 4 feet, are very common in New Guinea. They serve as clan totems but are also eaten. This more naturalistic clan bat would have been hung with others on the ceiling of the clan men’s house. 23.5 inches wide, 12.25 inches high.